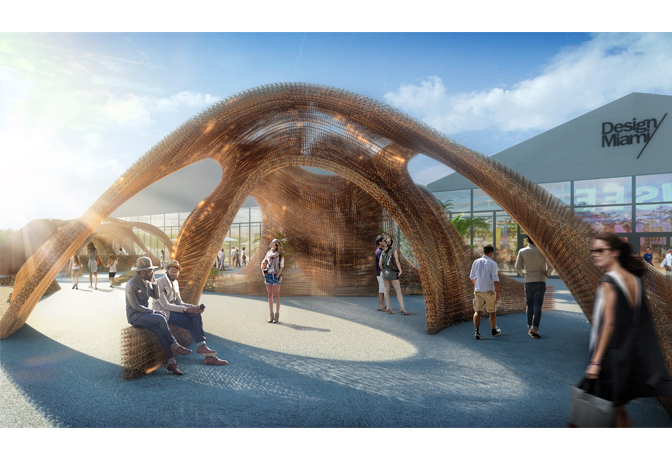 Researchers at the US Department of Energy’s Oak Ridge National Laboratory expect a project undertaken this fall to 3D-print portions of two outdoor pavilions will give them valuable insight into the use of bio-derived material to create large structures. 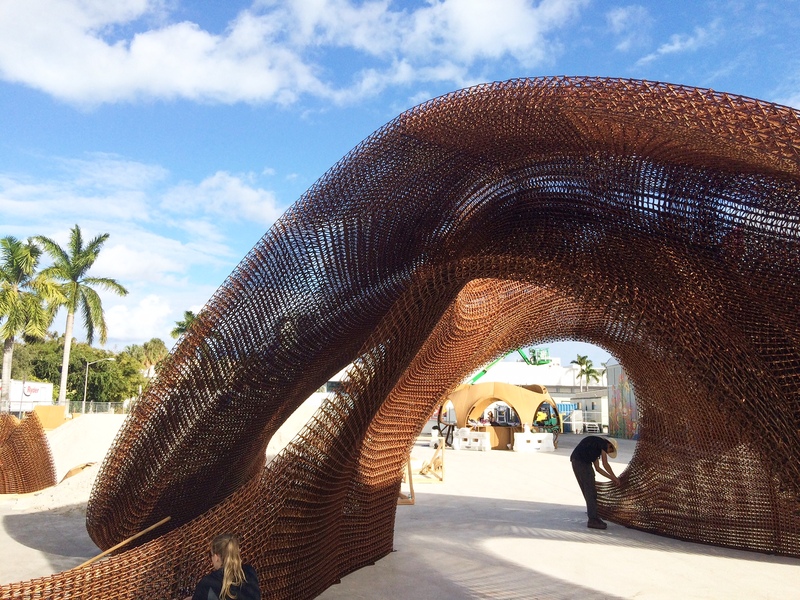 The lab was engaged by New York-based SHoP Architects to print large-scale components for two pavilions to be installed on the plaza outside the DesignMiami exposition in Florida from November 30 through December 4. 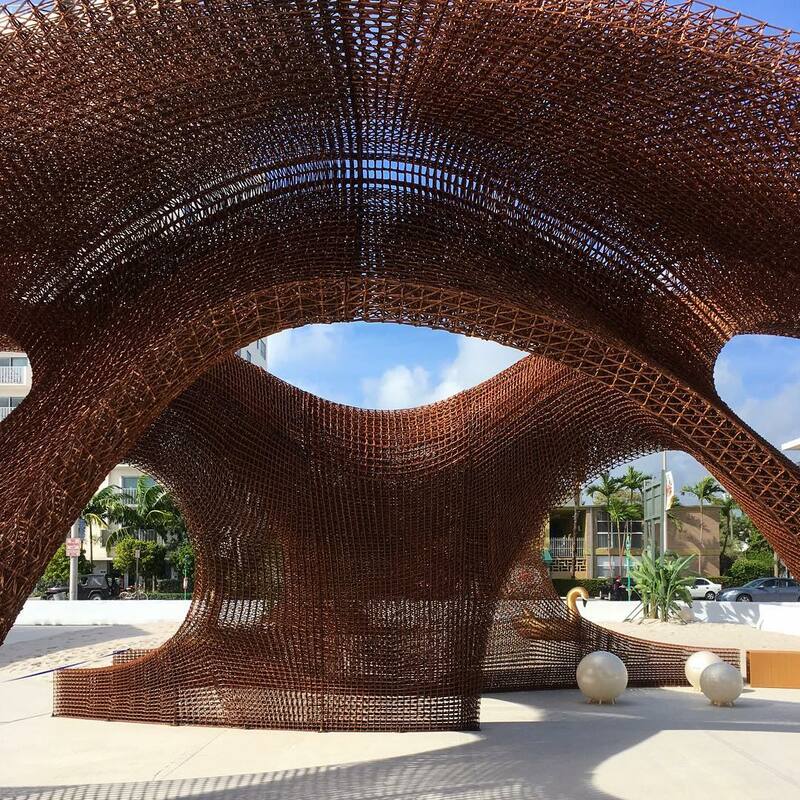 After the expo, the structure will be moved to the Miami Design District to house an outdoor cultural program for the next two years. 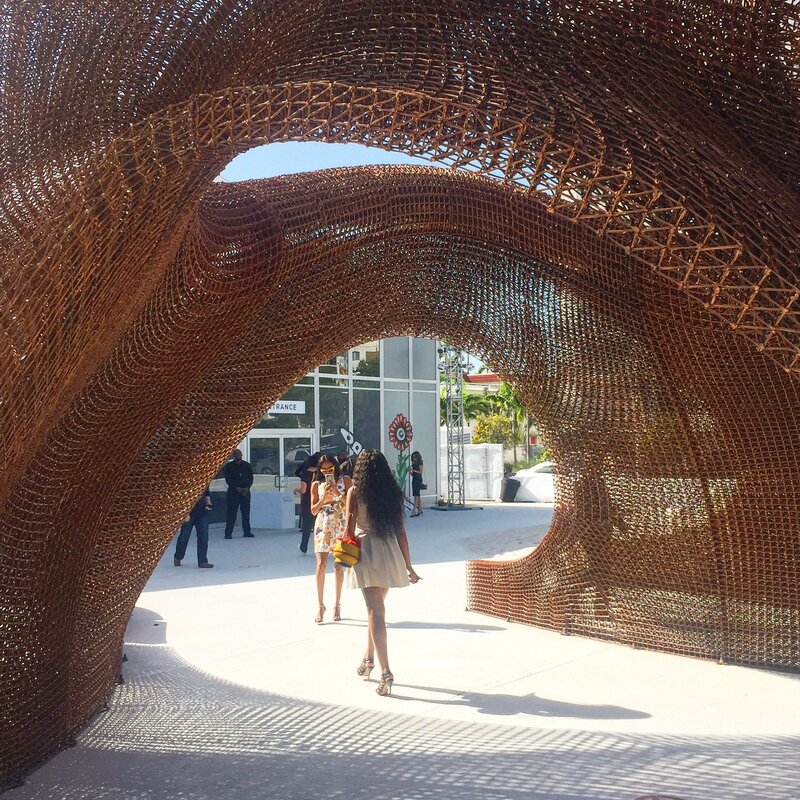 The pavilions, entitled “Flotsam and Jetsam,” are the largest structures ever commissioned by DesignMiami for its meeting—a global forum for design and innovation that attracted more than 36,000 attendees last year. The overhead portions of the structures were produced by Chattanooga-based fabrication firm Branch Technologies. ORNL’s task was to print the pavilions’ legs, which also function as seating and counter space. 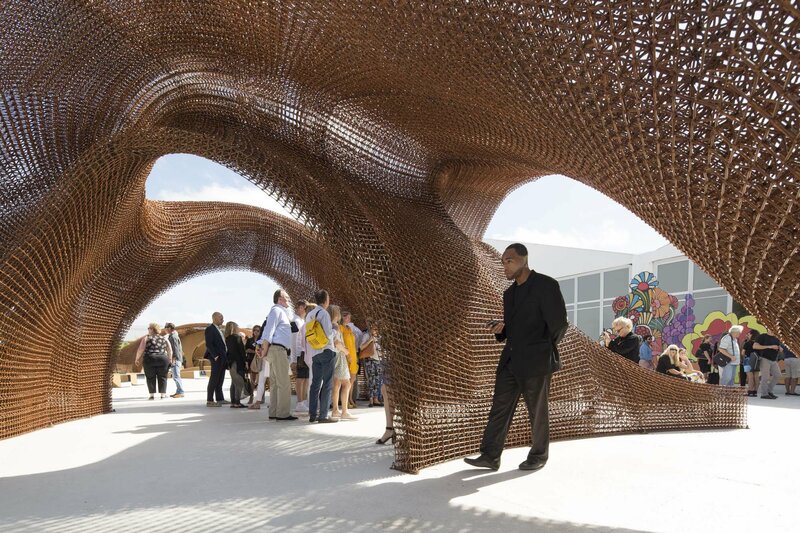 The result is a project that once assembled onsite in Miami is one of the world’s largest 3D-printed structures. ORNL holds the Guinness World Record title for the largest solid 3D-printed item: a trim-and-drill tool designed for The Boeing Company. For the pavilion, researchers employed the Big Area Additive Manufacturing (BAAM) machine—one of the largest 3D polymer printers in the world—housed at DOE’s Manufacturing Demonstration Facility (MDF) at ORNL. SHoP wanted to use an eco-friendly material for the printing, and the lab chose a bamboo composite. “Bamboo has interesting properties and we can obtain a high volume of it,” said scientist Soydan Ozcan of ORNL’s Materials Science and Technology Division. The project is estimated to have used about 10,000 pounds of material. “Bamboo grows fast in a wide range of climates—some species grow more than three feet a day” once established Ozcan said. It sequesters CO2—about 35% more per hectare than equivalent trees; it is a naturally organic product requiring no fertilizer or pesticides; and fibers derived from the plant are renewable and have low levels of embodied energy compared to synthetic fibers. “People like it too. It’s cool from a design standpoint,” Ozcan added. Ozcan and his fellow materials scientists were challenged with finding a composite that would result in a biodegradable structure, but one that would last in Miami’s heat, humidity, and salt air. Bamboo was also a familiar material to the ORNL researchers, as the lab had previously used it to print some smaller scale test items. The scientists settled on polylactic acid (PLA), a biodegradable, thermoplastic polyester sometimes referred to as a bioplastic, and in this case made up of about 20% bamboo and 80% PLA by weight, said Brian Post, an engineer in the Manufacturing Systems Research Group at the lab. The result is a printed product that has the properties of wood—the same sound, smell, and touch—and with wood’s recyclable characteristics. Bio-derived feedstocks have several advantages: the energy output required to produce bamboo is lower than the energy needed to produce petroleum-based materials like carbon fiber. And the overall cost of bamboo PLA is also lower, running about $2/pound compared to $5/pound for carbon fiber-reinforced polymer, Ozcan explained. 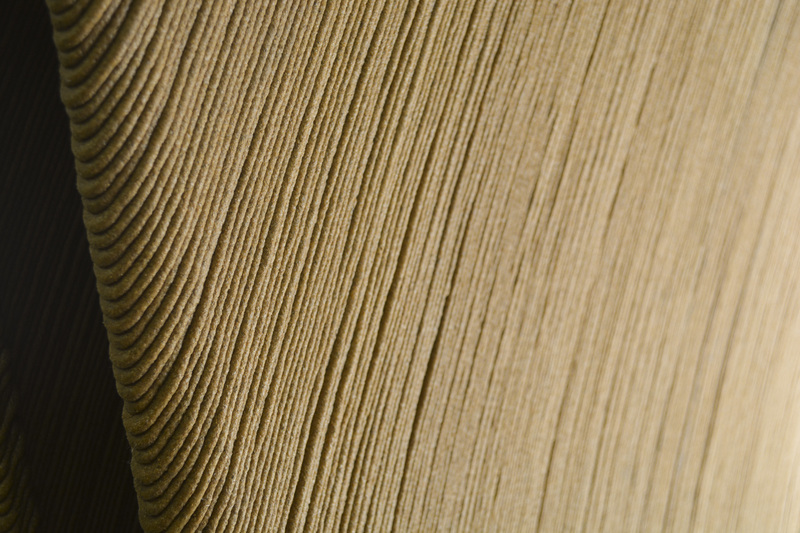 Using bamboo also improved the printing process, the researchers noted. The use of plastics in 3D printing can pose a problem related to coefficient thermal expansion (CTE), or how much an object might warp with the difference in temperatures between print layers. In 3D printing, material pellets are melted and then extruded through a nozzle to form the desired object layer-by-layer. If a material has a high CTE, then adding hot layers over cooler layers during printing can result in residual stress and a weaker end-product. But fillers such as wood can lower the CTE of the composite. Bamboo has a lower CTE than plastic and thus acted as a reinforcement, allowing the researchers to build larger parts with less distortion. Challenges during the project centered chiefly around the pace of printing. The researchers noted that the bamboo composite printed at about half the rate of other materials they were used to dealing with. “We had some blockages and flow interruptions, and that was a learning curve for us. It took about twice as long to print as expected,” Post said. The material required a printing process without stoppage, and so researchers took turns attending the machine 24 hours a day over a two-week period. But it is just those types of discoveries that the project was expected to yield, the researchers noted. “We learn the most from the projects that push our creativity,” Post said. The team has already gathered relevant data on the project, and will continue to do so as the structure is deployed, utilized, and eventually recycled. Other researchers involved in the project include Alex Boulger, Vlastimil Kunc, John Lindahl, Lonnie Love, Xiangtao Meng, Alex Roschli, Matt Sallas, Adam Smith, Halil Tekinalp, and Fue Xiong. This technology development was supported by DOE’s Office of Energy Efficiency and Renewable Energy – Advanced Manufacturing Office (AMO). AMO supports applied research, development and demonstration of new materials and processes for energy efficiency in manufacturing as well as platform technologies for the manufacturing of clean energy products.